One NY Restaurant Gives Its Guests the Chance to Enjoy Traditional Grilled Gourmet Treats Despite the Current Economy. NEW YORK, June 11 /PRNewswire/ -- Philippe Feret, Chef/Owner of Brasserie Julien, (Profile on ProfNet) has always sought to please his guests in innovative ways. Now he has rejiggered a way to serve delicious, and more expensive, cuts of meats in a fun way that his guests can afford. His newest dish is a "Hanging Brochette": a vertically presented combination of meats, including game, seafood, poultry, and vegetables featured each week, eg, Rack of Lamb, Filet Mignon, and Veal Sausage and Seasonal Baby Vegetables. To view pictures of the dish, click here: Hanging Filet Mignon Brochette (http://doiop.com/filetmignonbrochette) and Hanging Striped Bass Brochette (http://doiop.com/webstripedbassbrochette). "I decided to change the presentation of a classic dish. Our guests enjoy the different presentation, and they also get to enjoy meat that they might shy away from these days because of their budget. We are using smaller, more cost-effective pieces, but the same total weight, so it's a win-win. 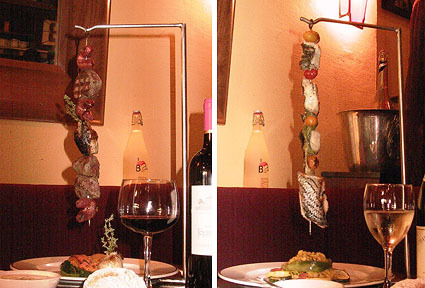 Normally a server pulls your meat off of the skewers or even presents them on the skewer flat on the plate. This way, you take one morsel off at a time without spearing yourself. It makes more sense and looks fun to eat!" said Feret. Just a heads up – a friend told me that Katie Lee Joel (yes yes Billy Joel’s wife) is holding a book signing for her new cookbook “The Comfort Table” in the Hamptons this Saturday the 21st! The event – which I have been assured will include COMPLEMENTARY specialty cocktails!!! – is being held at Yigal Azrouel’s new boutique in Watermill from 1pm – 3pm! Sounds like it should be fun! Hope to see ya there! I just heard about a book signing for Katie Lee Joel's (Billy Joel's wife) new awesome cookbook "The Comfort Table" at the new Yigal Azrouel boutique on 700 Montauk Highway in Watermill (Hamptons) from 1PM to 3PM. It's gonna be a lot of fun with FREE COCKTAILS! I can't wait. You're right. That is a little random.